Pistorius quizzed over Reeva screams Jump to media player South African athlete Oscar Pistorius faces intense cross-examination at his murder trial as the prosecution quiz him over whether his girlfriend screamed when he shot her. Oscar Pistorius trial - Day 19 Jump to media player Oscar Pistorius has faced a second day of intense cross-examination at his trial in which he was accused of being selfish, reckless and a liar. Oscar Pistorius trial - Day 18 Jump to media player Key moments of day 18 of the Oscar Pistorius murder trial, saw the athlete questioned aggressively about a video showing him at a shooting range and a graphic image of his dead girlfriend Reeva Steenkamp. Pistorius tells court: I made a mistake Jump to media player South African athlete Oscar Pistorius says he "made a terrible mistake" when he shot his girlfriend Reeva Steenkamp in his home. 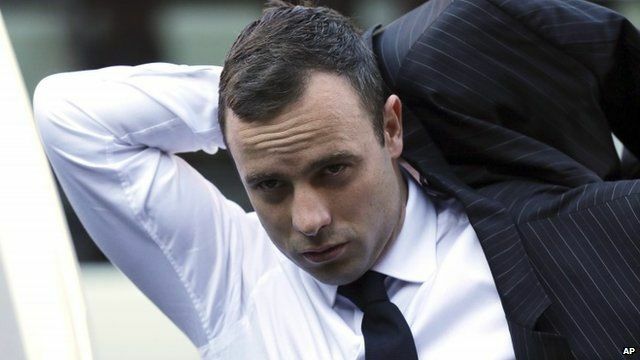 Pistorius recounts moment of shooting Jump to media player South African athlete Oscar Pistorius breaks down in court as he describes what happened on the night he shot his girlfriend Reeva Steenkamp. Emotional Pistorius apologises Jump to media player An emotional Oscar Pistorius takes the stand at his murder trial and apologises to the family of Reeva Steenkamp for killing her. South African athlete Oscar Pistorius faced intense cross-examination at his murder trial as the prosecution quizzed him over whether his girlfriend screamed when he shot her. Prosecutor Gerrie Nel repeatedly questioned Pistorious' evidence accusing him of 'tailoring his evidence' under cross-examination. Mr Pistorius, 27, has admitted killing Reeva Steenkamp but said he mistook her for an intruder.